BlogHome BLOG Uncategorized MainStreet is 5! MainStreet is five years old this week. We’re pretty excited about making it that far – 50% of small businesses fail within five years – but also pretty amazed at how quickly that time has passed. 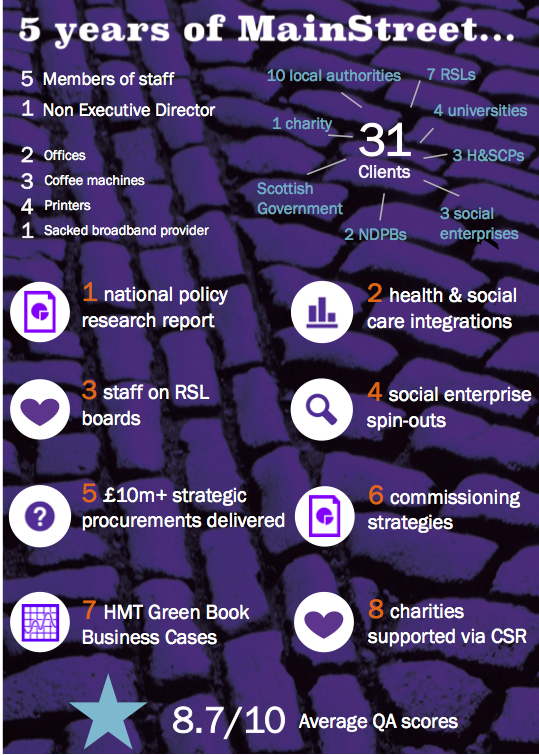 You could say that those five years have been exceptionally hectic and challenging generally, and especially for the public sector organisations we mainly work with. Since that first week of September 2013, we’ve had a referendum on Scottish Independence, a U.K. general election, the EU referendum, the Scottish Parliament elections, a round of Scottish local authority elections and another U.K. general election. But we spent a bit of time this week thinking about what that time has meant to us, and sketched that out in the picture below. We want to thank our friends, colleagues and partner organisations for their support since 2013. And a bigger thanks to all of our clients: without them (and the risks some of them took in the early days even just in appointing us) we wouldn’t be here in 2018, looking forward to another 5 years. next post: Taxing tourists – killing the golden goose?